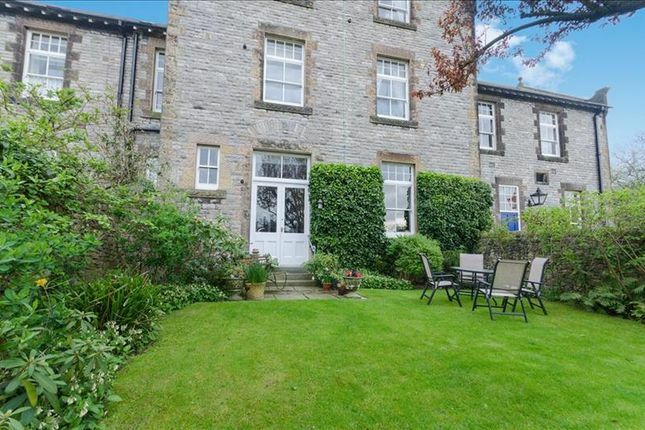 A well presented ground floor one bedroom apartment with off road parking and enclosed private garden, set in an attractive stone built historic building formerly the Matrons quarters. Retaining original period features including sash windows and ornate coving. A well presented ground floor one bedroom apartment with off road parking and enclosed private garden, set in an attractive stone built historic building formerly the Matrons quarters. Retaining original period features including sash windows and ornate coving, with gas central heating the accommodation includes shared entrance hall with storage and seating area, entrance hallway with study area, dining kitchen overlooking the garden, sitting room, bedroom and bathroom. The gravelled forecourt provides off road parking. Comprising wall, base and drawer units and resin sink set in roll edge work surface with tiled splashback. A four ring gas hob with electric oven beneath and extractor canopy above, including washing machine, fridge and freezer. With radiator and space for table and chairs. A rear aspect glazed door leads to the rear garden, with glazed panels above and rear aspect window and wall mounted Worcester boiler. A reception room with ornate cornicing and ceiling rose, dado rail and rear aspect sash windows overlooking the garden. An Adams style fireplace with marble inset and hearth houses an electric fire, also with radiator. A white and chrome suite comprising panelled bath with overhead shower and glazed screen, pedestal wash hand basin and low flush WC. With partially tiled walls, rear aspect sash window and radiator. A double bedroom with front aspect sash window, built in wardrobes providing hanging rail and shelving with sliding mirror doors, ornate ceiling rose and coving. The enclosed rear garden is laid to lawn with paved seating, planted beds, borders and specimen trees. The property is approached via a gravelled driveway providing off road parking.